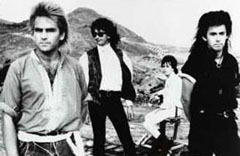 In the '80s, Mike Peters led the Alarm, the Welsh rock band best visually remembered for their "finger-in-the-lightsocket" hair. Musically, they were unfairly compared to U2, probably a result of both bands touring together. It's ironic that U2 was actually influenced by the Alarm's acoustic approach-just take a look at U2's JOSHUA TREE. That album smacks of the Alarm's acoustic based approach. Mike is currently the only original member of the Alarm touring and I got to catch his recent show in Atlanta. But Mike's new incarnation of the Alarm is no mere moldy-oldies, retro band act. 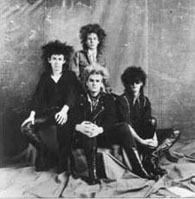 The new Alarm has the same spirit and strength (no pun intended) as when I saw them in the mid-'80s. The only difference is that I got to hear every single Alarm song that I loved! And, I noticed something peculiar as I watched the crowd-I have never been to a show before (maybe McCartney) that so many people in the audience knew the worlds to every song and was singing along. Before the show, I talked to Mike about WHY he is still relevant, WHY he carries on with the name THE ALARM and most importantly, WHY his old songs are so important. E.C. : Are there any Alarm tracks that didn't make it onto the collection, and if so why weren't they included on the box set? Mike Peters: The main things that didn't make it into the box set were demos. They were just too numerous to fit in. So I really wanted the main emphasis of the box set collection was to represent the work that was already released, but throughout the course of the first generation of the new album was there were a lot of b-sides released in Britain that never came out in America, so it was important to house the best work that we did that was released and then was supplemented with additional tracks that were from our processions that were released as b-sides. The album still worked as a whole, and obviously all the records were expanded for b-sides. There's no room to put the demos, otherwise I would've. I think it's possible, for the future, I can sort of see like an alternative history for the Alarm box set that would house the sort of "work in progress", as they say. E.C. : My brother used to spend a fortune on the imports because they had the b-sides. Mike Peters: That's why the box set began really, because a lot of people were always writing in asking is there gonna be a b-sides compilation album? Is the lot going to be available on vinyl or…and initially we went to EMI to group together all the b-sides and the first thing we did was an album called the BEST OF THE ALARM-MIKE PETERS, which is a European release sort of, to tie up all the things I've been doing as a solo artist. And then I did then talk with them about doing something more comprehensive "Best Of" and all b-sides, housing of like a big singles compilation. But while I was putting the "Best Of" of all my pieces together, I realized those things are delved into EMI, they didn't have any of the master tapes. Mike Peters: Well IRS wasn't going to throw them away, IRS relinquished the whole rights to EMI. And in the hat change over the security apparently lost, and so I did a lot of detective work and found the archive of it. And again, it had been 10 years left alone for 10 years. The archives have a policy, after 10 years if no one's paying the bills..
Mike Peters: Exactly. So luckily we got to it just before the 10 years ran out. So there's an element of luck involved. I think probably nobody came looking for those master tapes in 10 years otherwise the problem might have arose earlier. E.C. : Is there any chance of a video companion to the Alarm 2000 set? Mike Peters: Again, I've been looking into that, bringing it out. It's the sort of DVD-world…I think were a little way off from that. Wait for the technology to be accessible. At this point in time transferring to mpeg coded is quite an expensive procedure, unless there's a huge volume of sales. But, its something I'd like to see happen. E.C. : Knowing that hindsight is 20/20, what is your greatest regret regarding the Alarm? Mike Peters: (long pause) I don't have any. I wouldn't change anything. I think that it's important to let things happen, and stay "happened". I think that's all part of the learning curve, part of fate. I'm just glad that it happened. The bad things were good things in the long run. I mean life is all about ups and downs. The fact that the original members of the Alarm still have a certain amount of friendship & respect for each other…and that's been good. E.C. : What are the other original members of the Alarm doing now? Mike Peters: Twist is a public defense investigator in San Francisco. Dave Sharp lives in New Orleans. E.C. : He still plays music, though? Mike Peters: He does, he's involved in the New Orleans music scene. And Eddie McDonald is a photographer in London. And I think that sort of what put a strain on the band, two of the members of the band came to live in America. That put a big strain on the band, such a distance. Culturally and physically. Very big there was a gap in where we saw the band going. It's hard to act spontaneously if someone's flying back to make rehearsals. It means everything's a big deal, everything's expensive, everything is a big upheaval. E.C. : Do you have a response to the accusation that the Alarm 2000 tour is simply a cheap attempt to squeeze a few more bucks out of the Alarm? Mike Peters: No, no its not because it would be if we were playing to millions of people every night or something like that, but were not. What happened was the Alarm was torn down internally, not through my wishes…and this is my way of rebuilding the band. Yeah, some people see it cynically, but when we got in the charts, people thought we'd sold out. It's my way of saying there's a difference in the lineup- it would be cynical if I called it the Alarm, and hid the fact that there were new members in the band. But, were very upfront. And I think that anyone who has questions like that are fully answered in the show. I don't know one fan that's a diehard Alarm fan that went away disappointed. E.C. : Are you primarily playing the older Alarm hits on the tour, or are you playing more obscure songs? Mike Peters: At this point in time I'm doing something that we never got to do, which is go out and play the best songs from the 85 to 90 songs that were committed to tape by the band at the time. Every time we toured in the Mach I of the Alarm, there was something new or unfamiliar to the audience. There was always a new album. We never ever did a greatest hits tour. And so this tour is kind of a must see, its what every Alarm fan wants us to do. There's an emphasis on all the aspects of the band, there are some obscure songs. But its mainly kind of like the "best of", based on what the fans want to hear and based on 20/20 hindsight. Because a lot of the greatest of our songs were b-sides released in Britain. E.C. : Do you feel limited by the inevitable comparisons between your solo career and the Alarm? Mike Peters: No, because I never wanted to leave the Alarm in the first place. So, I always saw my solo work as being a continuation of the Alarm anyway. That's why I started Alarm gathering, started the Alarm web site, gathered all the Alarm fans together. In the concerts I not only played my own songs, but played songs by Dave Sharp. That's my way of keeping the true spirit of the Alarm alive. Now it's trying to unify the whole experience, and that's what I hope to do. All the lyrics of the Alarm, their my autobiography. I mean "Spirit of '76", that's ME, and my personal life experiences. There's a lot of negativity out there and I want to use every tool at my availability to bring things forward. And there's lots of new fans now that never saw the Alarm. I've tried everything to sort of bring the original members into the fold. I went down to see Dave a few weeks ago in New Orleans and we played together. But, he doesn't want to go there. He's happy doing what he does. All the original guys are behind what I'm doing now. At first they were behind it, then some of them got their nose pulled out of joint cause the reviews and the fans were going wild. But as soon as the people saw the band, it was amazing. So NOW, they [original Alarm members] are quite happy now, at least they are on the surface. They see that I'm not doing anything to denigrate the name of the band. Its all being done with really good taste, don't with respect. Mike Peters: Its not like I'm taking 20 grand from the shows. I mean there's no record label, so this is a genuine thing. And I think most people can see that. I think that anyone who knows me, knows I do things with integrity. You sweat blood to write those songs. And then sing them with all your might every night. But when your band members turn around and don't want you to be that lead singer anymore. Don't want you to write those songs anymore. What can you do? And that's what happened to the Alarm. At the end of the day, the other guys wanted other people to sing the songs and not me and they wanted to write those songs that I'd written for 4 albums. And so I said, its sort of a suicidal streak in me…I compromised ten years of my life on a point of principle and said to those guys, "there you go, YOU be the Alarm". And the result? There was nothing, not a concert, not a new album. And eventually everything fell back on me. And then all the Alarm fans that came to my show wanted to hear Alarm songs. I started playing them and I thought it was daft NOT to be called the Alarm. E.C. : When you first started your solo work, did you play Alarm songs live? 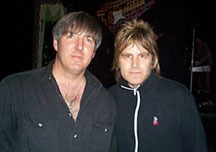 Mike Peters: I didn't play Dave's songs, but more my own. Mainly cause I didn't want people to think I had anything against Dave. HE wanted to become the lead singer of the band. He might deny that…he sang three on the last album. He wanted to do more on the next, wanted a guaranteed amount of songs to be written on the album. And that wasn't the Alarm. I could have stayed and fought, and fought and fought. I stopped writing songs cause I was just fighting for this equilibrium in the band. E.C. : The Alarm album, CHANGE, struck me as a very radio friendly album. Why wasn't that promoted more in the states? Mike Peters: Two things, there was a lot of family things hit the band at that time. Nigel's father committed suicide and my sister nearly died of a brain hemorrhage. And also, our record label, IRS was coming apart because they were about to lose REM. IRS did try to promote the album initially. What happened was, "Sold me down the river" - the week it came out in Britain, it was getting played, everyone loved it, it was a big radio record. Then there's a big disaster on the Thames [river], a pleasure boat was run overboard by a dredger and about 30 people lost their lives. So, immediately, you didn't want to hear a song called "Sold Me Down the River" on the radio in the aftermath of that. So, we had to withdrawal the whole campaign. There were just so many disasters happening to the band. And then IRS going down was a big thing. Because I think IRS didn't last longer beyond REM going. They really didn't have that many major bands left on the label. E.C. : I thinK you've already answered this question: the obligatory Alarm reunion question. Will it happen? Mike Peters: You never say never. But, I think realistically, the moment has passed now.. E.C. : In the early years, at least in the United States, there seem to be these comparisons of the Alarm to U2? Mike Peters: I mean there was similarity in spirit of the bands. We were both committed to our music. We both took it seriously. We were both trying to uplift the audiences. When we first came to tour in '83, we were compared to the "Clash meets Bob Dylan". I think the U2 comparison happened more, to be honest, when the JOSHUA TREE came out and then there were harmonicas in the U2 sound. The acoustic guitars are prominent. I'm not saying that they pillaged the Alarm, because actually U2 helped break the Alarm. The good bands, the really good rock bands of the '80s couldn't get on the air, the airwaves were still dominated by Led Zeppelin. In the '80s young bands couldn't get on the radio. Nowadays, commercial radio's built on the young bands. If the Alarm came out today, in today's climate, we'd be all over the radio. People look back on the '80s and say that was a lot of rubbish music in the '80s, but that's so wrong! There was great, there was brilliant music, but it was underground, it didn't get on the radio. E.C. : Well the "rubbish music" was what was being pushed! Mike Peters: Of course it was! Now, I think modern bands do have it easier in certain respects because if they sound a certain way they can get on the radio and all that. There's a lot of one hit wonders…loads and loads of casualties. I think the U2 comparisons was unfair, I really do. And that's one of the things I wanted to correct with the Alarm Box Set. I wanted to present it to all those people thought, "Oh, the Alarm sounded like U2". I think that was a comparison that came from people who didn't even bother to check us out properly. An unfounded criticism. E.C. : Criticism by the "suits" at the record label? Mike Peters: I would say it was the lazy people at the magazines! Because the NME didn't like the Alarm and a lot of American journalist took their queue from the NME. The NME's the little bible over here, to a lot of critics over here. And they took their queue from that. Half these guys that said we sounded like U2 that never came to see us play. The one thing I can do as an artist, which I think sets the Alarm apart is…and I've done it…I can sit there and play every single Alarm song that was ever recorded on acoustic guitar. And it's all there. And I don't think you can do that with some of the U2 songs! Try to play "Gloria" on acoustic guitar! Cause there's no chord structure to it, and that's what sets us apart. When U2 came round to writing songs like, "Still Haven't Found What I'm Looking For" and "In God's Country", "Where The Streets Have No Name" - where you could play on acoustic guitar, that's when the similarities really started. Mike Peters: Again, that was the punk rock thing. I grew up on punk rock and the Clash and it's all about breaking the barrier down. I've just stuck with that ever since. I think there's a new personality about music today. I travel a lot around America and I hear the same songs on the radio. All these stations right across the country are given a play list to play. It's still all that '70's classic rock, with U2 added to the mix. That's about it, that's as modern as they've got. In fact, so much corporate music is on every level now. There's control, there's so much negativity. There's so much music derived from negative emotions, its almost like "hope" is a dirty word now. Mike Peters: Something new will come, I don't know where its gonna come from. I don't think its gonna come from eighteen year old kids who accidentally re-discover rock 'n roll. I think that something could come from older people who have lived life and experience and relay that through great lyrics. Alternative is just a dirty word…that is gone now. Mike Peters: Exactly! Maybe it will change here and there. I don't know where it will come from, but I think that if I talk to you about it, and you talk to someone else about it, ultimately that could go a long way. Let's switch that radio off…lets listen to something else…lets look at these guys who have all been written off cause they're not 25 or 18 anymore. Therefore we don't play them on our radio station - they're too old. There's definitely an age-ism in rock n' roll now. And rock…pop stars now are being made by just being people plucked from the street. That's not what rock 'n rolls about. What signal is that sending out? I often find a lot of young guys in bands, "how can I get a record deal?" What do you want a record deal for? Shouldn't you be saying, "How can I get an audience?" E.C. : What do you think about Napster? Mike Peters: I don't particularly have an opinion on Napster. I don't think music should be free. I don't think music should be cheap. It should be nurtured, cherished, loved. E.C. : Are you working on a new album? If so, will it be called a Mike Peter's album or an Alarm album? Mike Peters: You might have to decide that one. It breaks my heart to see these young, really talented bands getting chewed up into the system. I remember a time if you'd signed to a major label it was such a sell out! But now…unless you've signed to a big label, you're a failure now. That's the double standard. The press have made bands think that they need to be on a major label now. All these guys in the big publications, Spin and Rolling Stone, they don't write about bands from unknown, indie labels. They're being taken out and courted by expense accounts. They'll write about bands that Sony flies London, or Warner Brothers brings the band from Britain so they get to see them on the doorstep. And they get nice first class flights out of it. Now that's not rock 'n roll. That guys not gonna dirty his Gucci shoes walking to see a punk rock band.